Do you have an all-too-obvious gap in your smile that’s caused by a missing tooth? That gap is more than a cosmetic problem. Missing teeth can often lead to other oral health problems, malnutrition, and even social anxiety. Whether you are missing teeth due to decay, gum disease, or injury, replacing them is a must. Dental implants can be used to permanently fill in the spaces caused by trauma or disease, helping a patient reclaim their complete smile. Dental implants are unique because they are the only tooth replacement that restores an entire tooth both above and below the gum line. Traditional dentures and bridges only bring back the crown of a tooth, not the root, which makes them much more unstable. With dental implants, a titanium prosthetic root is placed directly into the jawbone, and this is used to support a restoration that shows in the smile. This not only makes implants extremely secure, but it also means they don’t require support from the surrounding teeth and gums, which is a common cause of discomfort with other replacements. Because implants are built just like natural teeth, they look, function, and feel like natural teeth as well, creating something that is indistinguishable from nature. And, the new roots actually provide internal support for the jawbone, which can stop or even reverse the bone loss that is so common after tooth loss. 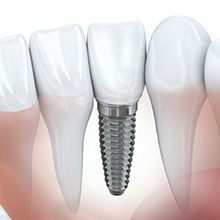 An implant can be attached to a single, all-porcelain crown using a small metal connector called an abutment. The new tooth will be free-standing on its own and not need to “lean” on other teeth in order to remain in place. Because of this stability, patients can look forward to a tooth that works seamlessly with the rest of their smile. Missing more than one tooth in a row? Two implant crowns can be placed on either side of the missing ones and used to support additional prosthetic teeth. This is a much more cost-effective option than replacing each tooth with an individual implant, and these bridges are much more natural-looking and stable than traditional ones as well. Are you missing a large number of teeth or have to contend with an ill-fitting denture that constantly slips out of place? If so, dental implants can be used to make a beautiful denture you’ll be able to rely on for years to come. Implant-retained dentures are secured directly to the jawbone using multiple implants, giving them a stability a removable prosthetic simply can’t match. Plus, for patients missing an entire row of teeth, they can be restored in just one well-planned visit using the patented All-on-4 procedure. Once you’ve scheduled a consultation appointment with your Virginia Beach implant dentist, Dr. Santos or Dr. Folck will perform an examination to see if you qualify for dental implants. 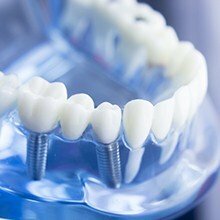 Most people are qualified candidates, but adequate jawbone strength and structure is necessary to support the implant. A bone graft procedure may be recommended if there isn’t enough bone density at the precise location where you need a dental implant. One of the dentists at Smile by Design will refer you to a specialist for the initial phase of your dental implant procedure. During minor oral surgery, this specialist will insert a small titanium post into the bone to ensure that your new tooth is as strong as the teeth you already have. The beauty of a dental implant is that this post mimics the form and purpose of a natural tooth root. As you heal from your surgery, the post and surrounding bone tissue fuse together to create a firm anchor for the tooth restoration that will eventually be attached to the implant. Moreover, the implant ensures that your jaw remains healthy by stimulating it to generate new bone cells. Once enough time has passed and your bone tissue has successfully joined with the post, your Smile by Design dentist will be able to attach your permanent new crown, which was handcrafted to match your other teeth in size and color. 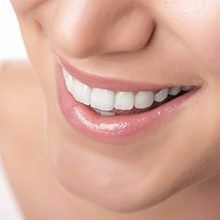 If you’d like to whiten your other teeth before your crown is attached, we have Zoom! whitening available to remove stains on your teeth. The cost of dental implants is usually broken up into two distinct phases: placement and restoration. Because implants are flexible enough to meet the needs of people with varying degrees of tooth loss, the price of these two procedures can be quite different from patient to patient. Certain factors like how many teeth a patient would like to be replaced, where those teeth are located, and if they have insurance coverage can all influence the overall cost of implants. While implant restorations do tend to cost more upfront than traditional ones, they are usually the best financial option in the long-run thanks to their longevity. 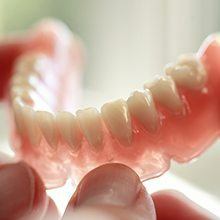 Regular bridges and dentures typically require periodic maintenance and need to be completely replaced every 7-10 years, costing thousands of dollars over the course of a patient’s lifetime. Implants, on the other hand, can easily last for 30 or more years, and only require consistent brushing and flossing to look and function like new.